(CNN) -- The United States warned the Indian government about a potential maritime attack against Mumbai at least a month before last week's massacre in the country's financial capital left nearly 180 dead, a U.S. counterterrorism official told CNN. 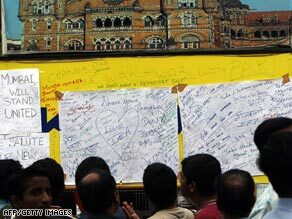 Onlookers in Mumbai read messages posted outside the Oberoi Hotel, scene of one of the attacks. U.S. intelligence indicated that a group might enter the country by water and launch an attack on Mumbai, said the source, who refused to be identified due to the ongoing investigation into the attacks and the sensitivity of the information. Indian security forces have confirmed to CNN that not only did U.S. officials warn them of a water-borne attack in Mumbai -- they were told twice. The area entered a higher state of alert for a week, including tightened security measures at hotels, but those efforts were eventually reduced, Indian officials said. Local fisherman in Mumbai said they witnessed a group of gunmen dock their boat Wednesday night, before heading toward the busy causeway. Four crew members who had been on board were missing. The captain was found dead, lying face down with his hands bound behind his back. India has made clear that it believes last week's coordinated attacks in Mumbai originated in Pakistan, but the Indian government is under pressure to explain the lapse of security that allowed the siege to occur. Pakistan banned the group in 2002 after an attack on India's parliament that brought the two countries to the brink of war. Indian security forces say they arrested a member of the group in February, noting that the man was casing Mumbai for an attack. U.S. counterterrorism officials continue to say signs are pointing to Lashkar-e-Tayyiba and they haven't seen anything to rule it out. However, they will not definitively say the group is responsible. At the center of India's investigation is the lone suspect in police custody, who Indian authorities say is Pakistani and trained by Lashkar-e-Tayyiba. Indian police say the other nine attackers were killed in three days of battles with police and the Indian military.